Welcome back! Fall semester is here and we're glad to be back at it! So much has happened over the summer and it seems that the rules keep changing. The welcoming tone here in the US, or the lack of that tone, continues to be such an important issue as we plan and implement our recruiting initiatives. And yesterday, DACA appears to be in jeopardy. The Intead team will be at NACAC next week and I will be presenting on these topics and the latest international student recruiting trends. I'm humbled to share the podium with Sundar Kumarasamy, Vice President of Enrollment Management at Northeastern University and Steven Bloom, Director of Government Relations at ACE. Please let us know if you'll be there too! Our Starbucks card is your Starbucks card - Let's grab a cuppa. Right now, we're going to jump right into what you expect from our Recruiting Intelligence blog with some great insights into using webinars effectively. 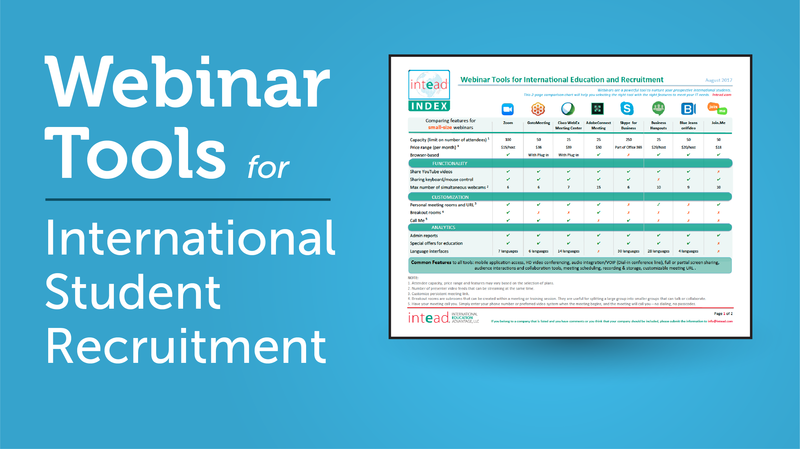 Hosting webinars is a popular strategy for international student recruitment – and for good reason. As you know (we’re sure you’ve run more than a few yourself at this point), webinars are flexible recruitment tools that can be effective at multiple points along the recruitment funnel – providing general information, generating leads and converting leads to applicants and enrolled students. The best part? The relatively low cost, of course. We know you don’t have an unlimited budget. There are also plenty of options on the market offering a wide selection of features like CRM integration and multi-language interface. But, you don’t have to break the bank to host successful webinars. There are several free options that don’t have all the bells and whistles, but might be more familiar to your prospective students. The big question: have you chosen the best tool to host your webinars? Does it make a difference? Turns out—yes, it does. This week we are exploring the wealth of options at your fingertips and helping you choose the most effective tool for your institution. Read on to explore the possibilities and download our free comparison chart (link at the end of this post). Special thanks to Lu Bai, our international student intern from Bentley University for her outstanding work researching webinar tools and features! Lu, you're the best; good luck completing your Master's this fall! We will cover a variety of information sources, marketing and technology services international university admissions and marketing departments purchase or use regularly. We will publish the lists regularly on the blog over the next few months. We will be publishing a compilation of these lists on a yearly basis. While we'd like to think that our research is comprehensive, we know that there might be service providers we inadvertently overlooked. That's where you, our loyal readers, come into the picture. We welcome your comments and additions to the lists. Feel free to use the provided link to share your feedback. We'd like to proudly introduce a new content source for you-- Intead Index-- a set of indices that provides you with all of the information you need to make informed decisions. We will cover a variety of information sources, marketing and technology services international university admissions and marketing departments purchase or use regularly. We will publish the lists regularly on the blog over the next few months.We will be publishing a compilation of these lists on a yearly basis. While we'd like to think that our research is comprehensive, we know that there might be service providers we inadvertently overlooked. That's where you, our loyal readers, come into the picture. We welcome your comments and additions to the lists. Feel free to use the provided link to share your feedback. 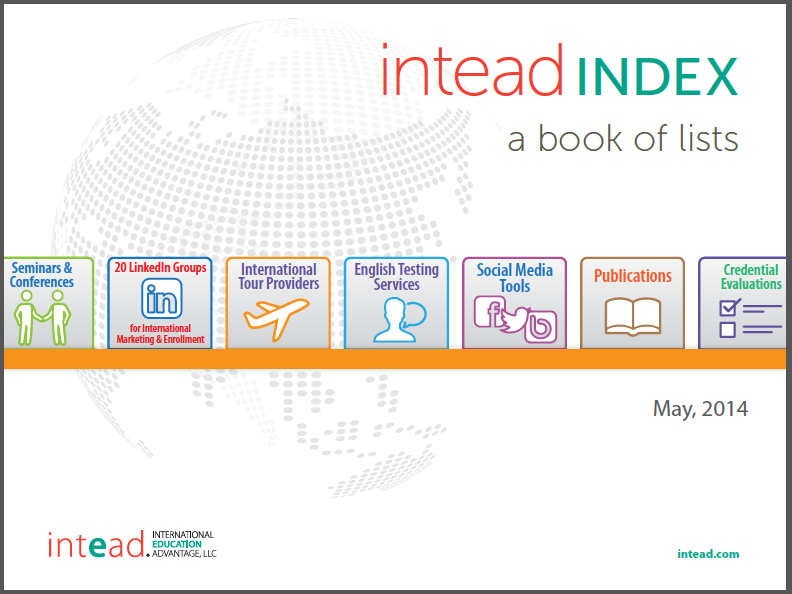 We'd like to proudly introduce a new content source for you-- Intead Index-- a set of indices that provides you with all of the information you need to make informed decisions. We will publish the lists regularly on the blog over the next few months. We will be publishing a compilation of these lists on a yearly basis. While we'd like to think that our research is comprehensive, we know that there might be service providers we inadvertently overlooked. That's where you, our loyal readers, come into the picture. We welcome your comments and additions to the lists. Feel free to use the provided link to share your feedback. Peanut butter and jelly. Batman and Robin. Abbott and Costello. And the most recent dynamic duo: teenager and internet. Since the iPhone became a regular at the family dinner table, the landscape of teenage life has changed—including how they search for, and ultimately choose, an institution of higher education. You already know this, and so do today’s wide range of digital lead generation services. These digital services can provide a more student-driven, personal search process that suits today’s independent and tech-savvy teens—a far leap from the mass mailings (or even e-mailings) from student search service contact lists. 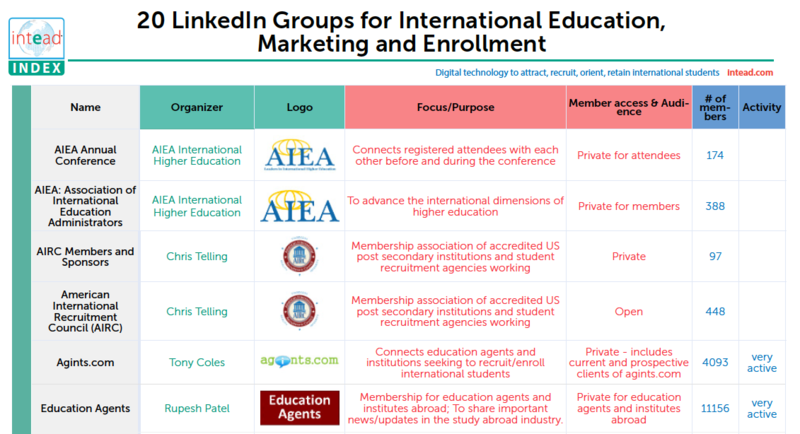 See our recent blog-- Digital Direct Marketing to International Students: Are You on Target? Several of these services even offer international expertise. Want to know where to start? Here are some key considerations.